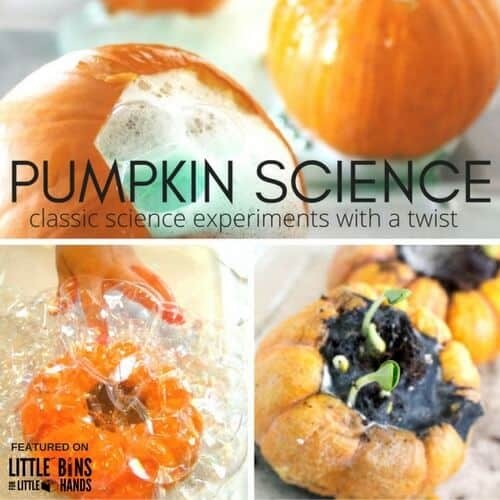 It’s the season for pumpkin book STEM activities and pumpkin science experiments! One of the things I love the most about fall besides the cider and pumpkin muffins is bringing out all our fun pumpkin science and STEM books! Our favorite books pair perfectly with fun fall STEM and science activities. Check out these pumpkin book activities that young kids will have so much fun trying! 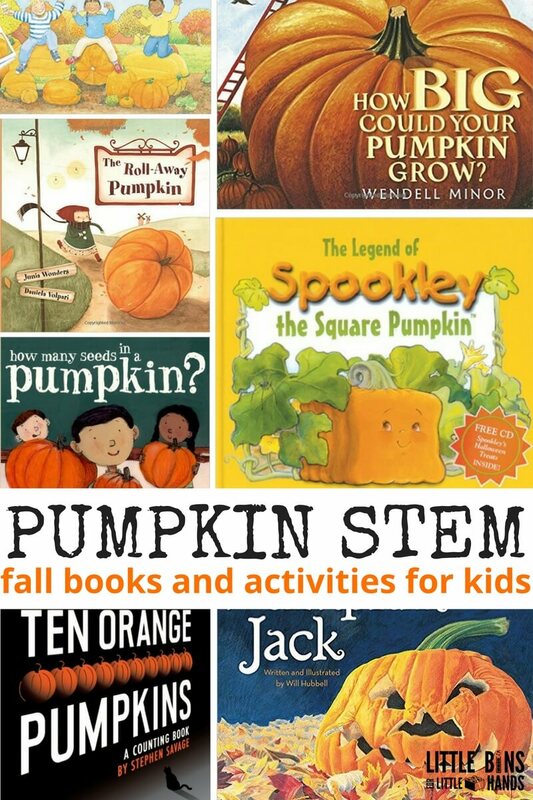 Some very fun ideas for pumpkin book STEM activities that you can easily do at home or with a group of kids. Have you read any of these? There are lots of ways to incorporate awesome STEM or science, technology, engineering, and math skills into a literacy activity. Our simple pumpkin STEM challenges will get kids thinking and doing this fall! Try these Pumpkin Learning Activities to learn more about how a pumpkin grows. Set up a Pumpkin Investigation Tray to explore parts of a pumpkin. Create a Pumpkin Squish Bag for some non-messy pumpkin investigation. 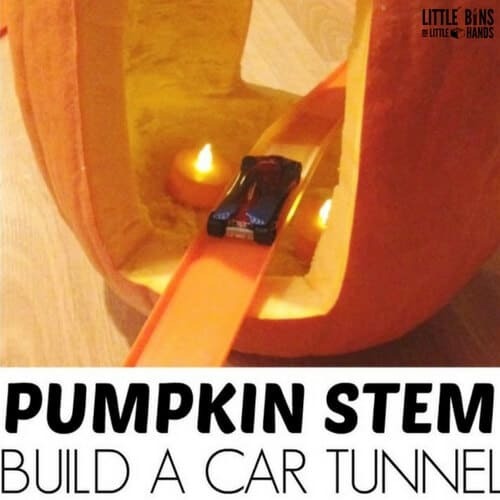 Try rolling pumpkins and set up pumpkin races using ramps to explore physics. Check out our apple version! Make your own Pumpkin Jack! Carve a pumpkin and let it rot. Investigate the fungus! Use a classic pumpkin candy or chunks of pumpkin with toothpicks to build structures. Clean out a pumpkin and dry the pumpkin seeds. Put the pumpkin seeds in a jar and practice your estimation skills or count them all. Clean out two different size pumpkins and see if they have more or less seeds. Do different pumpkin varieties have different amounts of seeds? Measure pumpkins at the pumpkin patch. Bring a soft tape measure or a piece of string and a regular tape measure to measure the diameter of different size pumpkins. Learn a little bit about diameter and radius too! Can you make a fence for 5 little pumpkins? 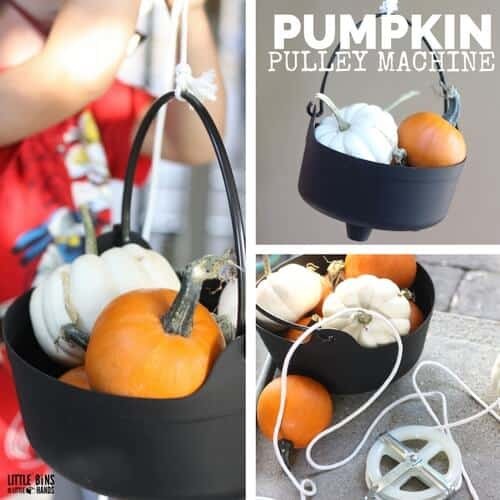 NEAT PUMPKIN BOOK STEM ACTIVITIES TO TRY! Click on photos to see more fun pumpkin science ideas!